In 1980 at the Cologne motorcycle show, the world saw its first Katana. With its advanced and aggressive body styling, which broke from the more traditional motorcycle styling leading up to that time, it was sure to be a show stealer, and it was. 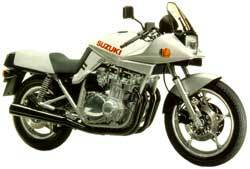 The GSX1100S Katana was released the following summer, in 1981. Quite a lot of people thought that the Cologne 'concept' bike would be for show, with not many features retained on the production bike. They were to be proved wrong, for in 1981, when the GSX1100S Katana was released it retained the same styling with just a few improvements and changes here and there. The Katana was designed by Hans A. Muth of target DESIGN in West Germany. As well as designing the Kat to be a real eye catcher, they also spent time investigating the best positions for rider comfort. So the large capacity tank and small fairing are blended together for the best airflow around the rider and the bike, not just for stunning appearance. To gain entry for the bike into Production racing, Suzuki released a 1000cc version. These are very rear (and expensive) in the UK and can mainly be distinguished from the 1100 by the use of 32mm slide carbs (see picture on the right) as opposed to the 1100's 34mm CV items. "...I guess another very interesting photo is that one with the gray-bearded man. It was made in summer '96 on a special-meeting of the Berlin Kat Friends - he is no real driver - but he is the godfather of the KATANA!!! Last year he was invited to a little stand in Berlin for talking a little bit about the "Katana-story" and all other related stuff. There were about 30 Katana-followers (unfortunately not me) who could there and they talked about everything to do with the development of the Katana. 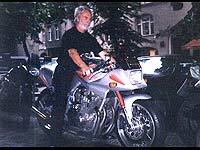 The Photo shows him on a "harmless-changed" Berlin-Katana. One of the auditors told me he is an uncomplicated, very nice and smart guy.